In January 2013, our family moved to Boulder from Cambridge, Mass. Our daughter Caitlyn, 6 ½ at the time, was attending an independent school in Boston. We had no experience with Montessori, but when we visited Mountain Shadows, we liked the mixed-age classrooms, individual lessons, and self-directed learning. Caitlyn’s preschool was based on the Reggio Emilia approach, so my husband Chuck and I were immediately drawn to Mountain Shadows’ classroom environments, all filled with natural light, order, and beauty. Caitlyn joined Mountain Shadows half way through first grade. She transitioned beautifully, quickly making new friends and learning new skills; however, I struggled with the feeling of not knowing exactly what she was learning or more importantly, how she was learning it. Chuck and I attended traditional schools as children, and the way we learned was so different. Given our unfamiliarity with Montessori, how would we know if we had made the right choice in selecting Mountain Shadows for Elementary school? In the fall of 2014, Chuck and I attended our first Parent Visiting Night. 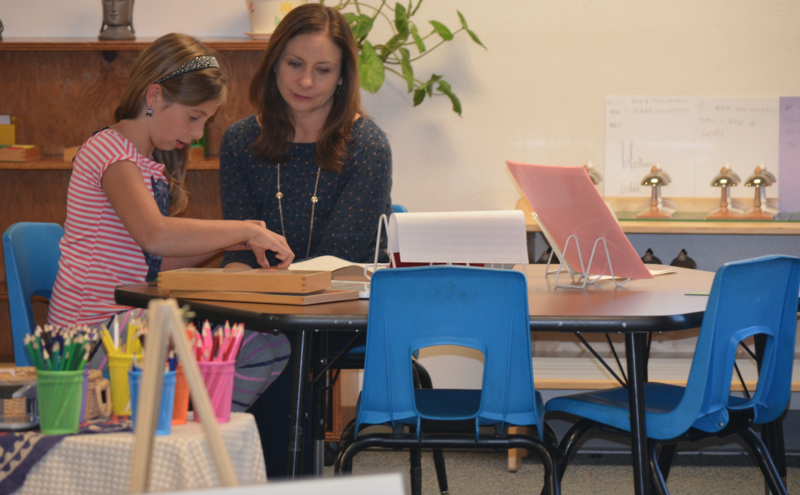 During Parent Visiting Night (held twice a year), Primary and Elementary children have the opportunity to present lessons to their parents. I do not remember the lesson Caitlyn presented that night, but I do remember the qualities she demonstrated – confidence, enthusiasm, adeptness, and joy. I was amazed that our 7 year old had acquired such in-depth knowledge and was able to clearly explain the lesson. Through our discussions, I also realized that she had not simply memorized the solution, but actually understood the why behind it. Wow! In August 2013, our son Liam joined the school, so we have had the benefit of attending Parent Visiting Night over the last five years for both children. Our children have similar learning styles, but very different personalities, yet they each consistently show the same qualities I saw at that very first Parent Visiting Night. Every once in a while, those feelings of uncertainty creep back up, but then I have the opportunity to attend Parent Visiting Night and am amazed once again by what my children have learned. I hope I see you at the next one.